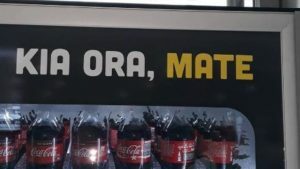 A Coke vending machine with the words “Kia Ora, Mate” is doing the rounds on Twitter, with social media users pointing out the dangers of mixing te reo and English. “Mate” is Māori for “death” which brings a whole new meaning to the sentence – and definitely not the one Coca-Cola intended. An article at the New Zealand Herald rounds up the responses, which were kicked off by a tweet. Twitter user @waikatoreo posted the photo on Sunday, saying “Coke got an unexpected result when they mixed Māori and English”. Click through to see what people had to say!